Brexit: Will the UK leave the European Court's jurisdiction in 2019? The claim: The UK will leave the jurisdiction of the European Court on 29 March 2019. Reality Check verdict: Unless there is a "no deal" Brexit, the government's current policy is to enter a transition period from March 2019 to the end of December 2020. During this period the UK will continue to abide by European Court rulings. 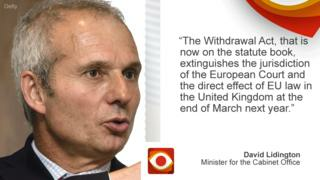 David Lidington, the Minister for the Cabinet Office, told BBC Radio 4's Today programme that the European Court of Justice's (ECJ) jurisdiction "extinguishes" on 29 March 2019 - at the end of the Article 50 process. The UK is expected to leave the European Union next March and then enter a transition period. This period is meant to last until the end of December 2020. The government calls it an implementation period and says it will allow for the "orderly withdrawal" of the UK from the EU. During the transition, the UK's relationship with the EU will be similar to what it is now. For example, it will continue to belong to the single market and the customs union. The UK will also continue to be under the full jurisdiction of the ECJ. The draft withdrawal agreement, published by the European Commission in March, sets out the terms of the transition. It said: "The Court of Justice of the European Union shall continue to have jurisdiction for any proceedings brought before it by the United Kingdom or against the United Kingdom before the end of the transition period." In January David Davis, the Brexit Secretary, was asked directly in Parliament if the UK would be under the jurisdiction of the European court during the transition. He replied: "Yes, in that period." Of course this is all predicated on the government securing a deal on its future relationship with the EU. As Theresa May and others have previously said: "Nothing is agreed until everything is agreed." So if the government failed to agree post-transition terms with the EU and the UK ended up with a "no deal" Brexit, then the UK could leave ECJ jurisdiction in March 2019. But that is not the government's current policy. The Cabinet Office told us Mr Lidington's comments would only apply in a no deal scenario.